Tarot cards can help reveal your future. However, remember you also have the power to change any future outcome. The purpose of having a reading is to improve or maintain your life situation. Often, people who have a positive outlook have the power to improve their life and future direction. A reading may present several options and it is important to pick one that will have a positive impact on your current situation. Also, trust the tarot reader. They know how to steer their clients towards the best course of action. Here are several things you should know about tarot card readings and how maintaining a positive attitude can make your future brighter. A wise man once said, “Depression happens when we are focused on the past, not the present”. The tarot card shows your past to help you learn from previous mistakes. Also, don’t cling to the past. Instead, let go of any bad memories and focus on your present. Consider living in the moment to appreciate life’s simple joys. For example, when at home, instead of thinking about work, focus instead on talking with your family. By focusing on the present, you may avoid possible future regrets. Besides, it’s far more productive doing something today than mourning past mistakes. Meanwhile, the tarot may also present several options that can improve your situation. However, don’t choose an option because it’s easy. Instead, pick the one that can make you a better and happy person. A lot of people are worried about their future. Their concerns often focus on money or relationships. However, once a tarot reading shows a possible bright future, any pessimistic attitudes will instantly evaporate as you are filled with hope and anticipation. For example, predictions about you meeting a potential soulmate will no doubt make you excited about that future event. But don’t just content yourself by merely waiting for when it happens. Instead, consider preparing for when you meet them for the first time, by improving yourself. 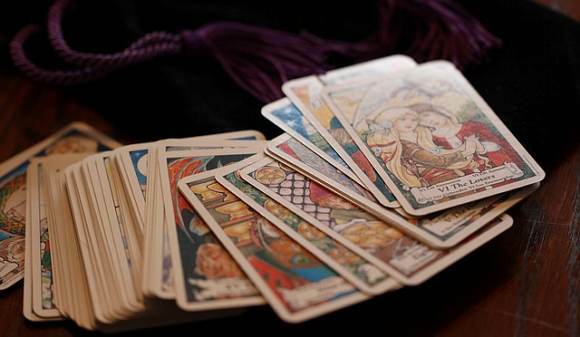 In tarot readings, you can decide how to interpret the scenario you are presented with. You should consider controlling any negative feelings that immediately come to mind. Based on your viewpoint and your attitude, you have the power to change the outcome of any situation. Tarot readings will help you to avoid wallowing in self-pity or negativity. They will seek to challenge your attitudes and guide your brain towards the positive side. The reading can also provide a list of positive attitudes and beliefs you can use in place of your bad ones. Let’s use some examples you might come across. When faced with the following scenarios what is your usual attitude? Scenario A – Your first prospective client for the day turned down your proposal. Negative – The first rejection means that the rest of my prospects will also reject me. Positive – This is just my first prospect, the next is different and will say yes to me. Scenario B – An unknown client has unexpectedly given you a big sales contract. Negative – A lucky break unlikely to be repeated again. Positive – This sale is just the first of many! Inevitably, you’ll meet a lot of complainers. They are more likely to see things from a negative perspective than take the initiative to do something about it. Try to avoid these types of people as they have a cynical attitude on successful people. For instance, telling them about your success may get you some congratulatory remarks. However, you can sense their insincerity, since their demeanour and outlook tell you that they would rather hear about any negative things happening in your life. So, if you want to maintain a positive attitude, choose your company carefully. Associate yourself with others who share your positive outlook. Happiness is contagious so don’t put up a barrier; feel free to catch it! Tarot card readings can also steer you away from a life filled with complaints and negativity. Often, a spread of cards will offer you suggestions to keep you busy accomplishing many positive things. When someone says, ‘How are you?’ consider responding with, ‘Great’ or ‘Terrific’. It also works better when you mean it. Tarot cards are divination tools that can help you adopt a positive attitude while facing challenging situations. Armed with happy thoughts and can-do attitudes, you can shape the future according to your will. While changing your outlook from pessimistic to positive won’t happen overnight, it’s important to take that crucial first step. As you improve your mood, you’ll find it easier dealing with any challenges that come your way. The process of looking for and finding a solution can also be fun, so be positive. Megan Neal writes for psychicfuture.com, a site that offers psychic, online tarot readings, and horoscopes. They provide insight to people who need guidance and assistance in dealing with life’s problems.